The advocacy season is upon us. NYC's preliminary budget has been discussed. 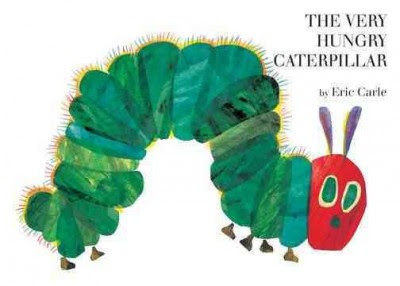 And once again, things are looking pretty grim for NYC libraries. A cut of $106.7 million dollars has been proposed - you can read the testimony of the library heads here. I don't think I need to remind you of how devastating this kind of cut would be. • 1,445 staff members will be laid off and another 124 lost to attrition. • At least 66 libraries will be closed altogether and dozens of others will have their hours drastically slashed. • Today, the average library in New York City is open about 44 hours per week. This proposal would bring that average down to a dismal 22 hours per week. This is certainly not sufficient to serve working families and students." This is ridiculous. This is wrong. This is something we cannot let happen. In terms of what YOU can do to help: there will be petitions to sign and events to attend and letters to write. I will keep you posted on what you can do as these things are confirmed. In the meantime, so I can feel like I am doing WHATEVER I can do, I am going to be compiling quotes on my blog from NYC residents about how they use their libraries - this will be sort of an "open letter" to Mayor Bloomberg that can be shared (and that I will actually mail if I get enough responses). If you'd like to contribute a line or two, please comment on this post, tweet at me, or email me at ScrewyDecimalBlog@gmail.com. I want everyone to see that these libraries ARE being used and need to be fully funded and adequately staffed. We are going to fight these cuts. We are going to show the mayor that NYC needs its libraries. We are going to do this until we're blue in the face. Because we're New Yorkers, dammit. We don't sit back and let things happen to us. We make them happen. Then, out of nowhere, a statement about witches gets thrown down on the page. Huh? There are no witches in the Strawberry Shortcake universe! WHAT THE HELL IS GOING ON HERE? 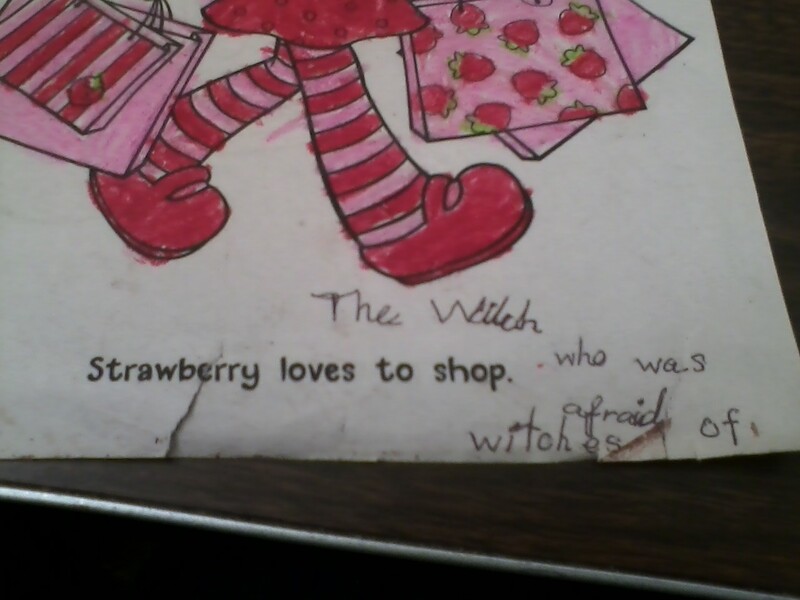 Now, I'm aware of the kid's book "The Witch Who Was Afraid of Witches," and maybe the person coloring the page was writing the title down to remember for later, but that answer is just seems TOO EASY, my friends. I'd like to think there's a deeper meaning here - that Strawberry is not just a shopping bag-toting, fruit hat-wearing layabout, but a pensive, complicated figure who, deep down, is afraid of her darker side - a side that she hasn't been able to show her cupcake-eating, flower-sniffing friends for fear of judgment and ridicule. Just think about it. What does this mean? 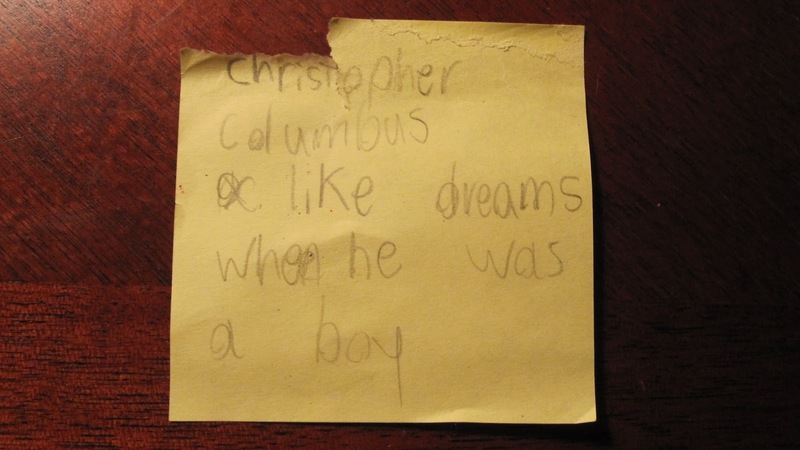 Did Christopher Columbus HIMSELF like dreams? 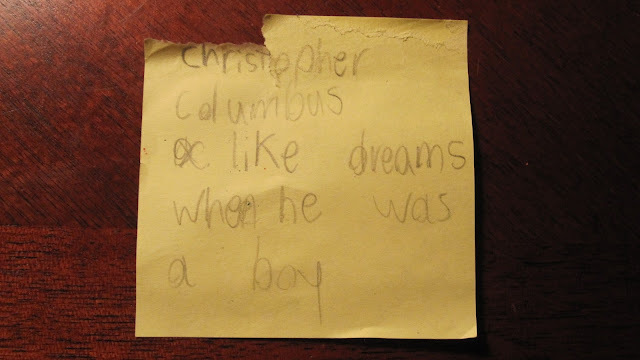 Or was someone else having "Christopher Columbus-like" dreams? What would a Columbus-like dream consist of, anyway? Boats? Oceans? The wanton destruction of a race of people fueled by greed and misplaced imperialism? WE NEED MORE INFORMATION.